Back in my previous life, I was a finance guy—that’s what my undergraduate degree is in, and that’s how I made my living for many years. Through it all, one particular piece of gear was always at my side, ready and willing to help with the trickiest of financial calculations: my Hewlett-Packard HP-12C financial calculator. From tests during undergraduate school up through my career change in 2005 to full-time Macworld employee, my HP-12C was with me every step of the way. What’s most amazing about this is that I’m not talking about a progression of different HP-12Cs; I’m talking about one HP-12C that is probably older than a fair percentage of the people reading this article. Though I’ve long since lost the receipt, my HP-12C is approaching its 25th anniversary, and it still runs just as well today as it did when brand new. (I still have the original Owner’s Handbook and Problem-Solving Guide, too—all 246 pages of it!) Suffice it to say, I know this calculator inside and out, though it doesn’t get as much use now as it did in my prior life. When Hewlett-Packard released iPhone versions of its classic calculators, including the 12C (along with the 12C Platinum and 15C), it just made sense for me to take the HP-12C for a spin through our review cycle. Although this review is specific to the 12C, it should be applicable to the other apps as well, at least relative to how they work on the iPhone. The first thing many people noticed about the HP iPhone apps was the price—at $15 for the HP 12C Financial Calculator (and $20 for the 12C Platinum and $30 for the 15C), these programs aren’t cheap. However, they are full-fledged replacements for physical devices that are still sold today—$70 for the 12C and $80 for the 12C Platinum. (The 15C is out of production, but used models are selling for in excess of $150 on eBay!). So the question isn’t whether $15 is a lot relative to other calculator apps, but whether it’s worth it compared with buying an actual HP calculator. The iPhone version of the HP-12C is a near carbon copy of the actual machine. It not only looks the same, but it actually runs the same code as do the physical calculators. The iPhone version is actually a bit better than just a clone of the original, though, because HP includes a simplified portrait-mode calculator (the 12C is a landscape-mode device). When used in portrait mode, you can use the number keys, along with all the usual math operators and a couple of other functions such as square roots and memory—perfect for those times when you just need a basic calculator. Wider Is Better: The HP-12C is in its glory when you rotate it to its full-power landscape mode orientation. 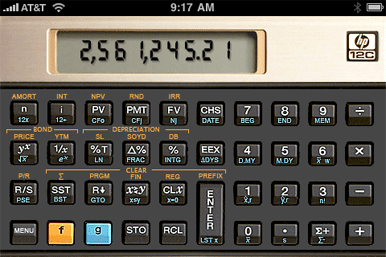 The real power of the HP-12C is found when you rotate your iPhone to landscape mode; what appears on the screen then is a photographic reproduction of the actual HP-12C calculator, complete with the gold-brown-orange-blue color scheme that made the original so…endearing? Because the app uses the actual calculator’s code, absolutely everything works just like it does on the real calculator. Every function, every key, even the ability to create programs—and you haven’t lived until you’ve coded hundred-line-programs for an HP calculator, one key press at a time—it’s all there, and it all works. To make sure the programming worked, I tested some demo programs from my user’s guide, and they all ran just fine. Speaking of the keys; they darken when tapped, but as they’re under your finger, that’s sometimes hard to see. There’s also a somewhat-too-loud (and not mutable without muting your iPhone) key click to let you know when you’ve pressed a key. This is an important feature, because not every key on the calculator changes the display. I do wish, however, that the volume of the click was user-controllable. HP includes a user guide (tap the Menu button, which replaces the real version’s On button), though it’s an abbreviated version of the full guide. You won’t find, for instance, the chapters on how to program the calculator, which is a shame. Creating simple programs to ease repetitive tasks is one of the best features on the HP-12C, but you really need the full manual to learn how to do it. HP even went so far as to replicate the data table that appears on the back of the physical calculator; tap the HP logo at the top corner of the screen to see it. Because HP is using the original source for the iPhone version of the calculator, you don’t get much benefit out of everything the iPhone has to offer. You can’t copy and paste the results from the HP-12Cs display into another app. You can’t use gestures, and there’s no use of the larger screen to, for instance, display the values sitting on the stack (the stack holds previous results, making it easy to reuse them in future calculations). So is the HP 12C Financial Calculator app worth $15? If you’re an HP-12C user, or you’re contemplating buying one, the answer is a resounding “yes.” You’ll be able to carry around one less device without giving up any of the physical calculator’s capabilities. (And if you haven’t bought your physical HP-12C yet, you’ll save $55!) You won’t gain a lot of new iPhone-specific features, but you will get a fully-functional digital representation of the physical device, and it will run many times faster than does the original. HP 12C Financial Calculator is compatible with any iPhone or iPod touch running the iPhone 2.2 software update.